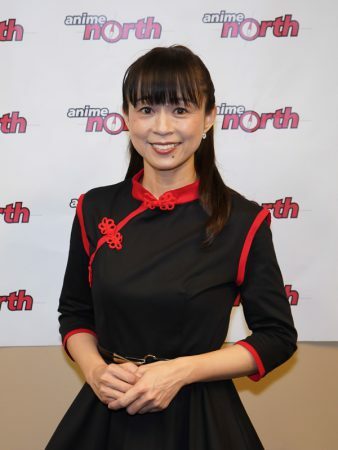 In May 2018, she visited Anime North, Canada’s largest fan run Japanese animation convention in Toronto as a guest and Ricepaper got a chance to meet her there. Many attendees broke down in tears upon meeting their favorite Japanese idol as her music and voice meant a great deal to them. Ricepaper Magazine, JF Garrard (JFG): Can you talk a little bit about being a seiyuu or voice actor, and what it’s like to work on a project? From audition to marketing? Junko Iwao (JI): I am usually only told the title of the production and cannot choose the role I want to audition for. Often, the director will offer me the audition with the role already chosen. Therefore, the auditioning has already begun by the time I am offered one. Even if I want to play a different role, the role for my audition is already pre-selected. When I go to the studio to record a 30-minute episode, it takes approximately four hours. Over time, as the cast and myself become familiar with our roles, a new episode might take three and a half hours instead of four, and then reduce to two hours. However, if a new voice actor is added to the cast, the dynamic changes and the recording goes back to four hours per episode until we create a new atmosphere with the added cast member. The entire cast is usually present in the studio for recording and there are only four microphones to share between 12 to 18 voice actors. Since we don’t have individual microphones, we wait our turn to speak and then sit back down until our part. We don’t have any role in marketing. JFG: Having been in the industry for a while, have you seen any changes take place? JI: Since I started, voice actors are now expected to be multi-talented. For example, aside from giving life to a character, they are also expected to sing, do autograph signings, have photo magazines, be active on social media, be able to perform dance at events, etc. Competition is quite tough! JFG: What has been your favorite project so far? What new projects do you have coming up? JI: I’ve been in so many projects, I like them all! The most memorable is “Perfect Blue.” This production was the first anime film directed by Satoshi Kon. It was a big honour for me to be a part of this project. Even today, at events abroad, people still refer to me as “Mima” (the main character in the film). After twenty years, people still remember this anime film and character, which I am forever thankful for. JFG: What are some challenges you have faced and what have you learned? JI: A long time ago, I had to rest my voice for a year. It was very hard for me to be away from the job, but this period enabled me to become a better voice actress. The desire to come back to voice acting allowed me to focus on my vocal training. It was a difficult time, but thanks to ample rest, I was able to come back and continue working as a voice actor! JFG: Why did you want to become a voice actor? JI: When I was little, I loved watching anime and singing the opening songs. This inspired me to audition for a talent management agency. After entering the agency, I moved to Tokyo and gave myself ten years to fulfill my dream to become a voice actor. I took vocal lessons and received jobs to sing in commercials. I was also involved in musicals and an acrobatic group (doing backflips!). During my tenth and final year [working] to pursue my dream, I received my first voice acting role. Interestingly, I was given the opportunity to audition through a friend and not through the agency. This memory is a reminder to me that you don’t know where and when an opportunity can arise. JFG: Are there any anime you’ve worked on which you want to see a remake or sequel? JI: Montana Jones! This was my debut anime role. I would love to play this role again!